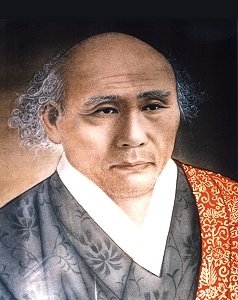 The Kwan Um School of Zen was founded by Korean Zen Master Seung Sahn. He took the powerful teaching and practice traditions of his great Dharma ancestors and predecessors in Korea and turned them “upside down”, creating a clear and simple teaching style that could break open the minds of American and European students. The spiritual health and worldwide presence of the Kwan Um School today bears witness to his success. Looking back to the Korean roots of Zen Master Seung Sahn, we can easily discover the origins of his hard-hitting, clear-eyed approach that has benefited so many students and his western Dharma successors. Korean Seon Buddhism branched from Zen’s Chinese origins long ago. 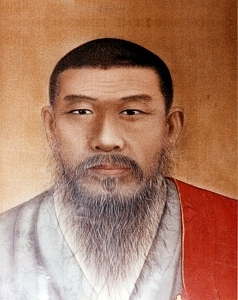 It later was reinvigorated by Tae Go, the famous Korean monk who went to China and received transmission in the Lin-chi lineage of Chinese Zen. This line became established in the Chogye order of Korean Buddhism, which continues today to be the prime Seon monastic order in Korea. Tae Go’s tradition continued down the centuries, passing through periods of decay, suppression and degeneracy, only to come back to life in great Korean Zen masters in the nineteenth century: Kyong Ho and Man Gong. Here are some of the stories of these immediate ancestors of Zen Master Seung Sahn. 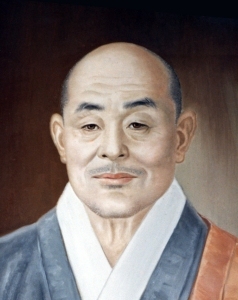 Zen Master Kyong Ho (1849 – 1912) reinvigorated the Korean Zen tradition after a long period of suppression and isolation during the Korean Joseon Dynasty. Early in his monastic career, he established himself as a leading teacher of the Buddhist sutras. He was famous for being unorthodox as well as quite smart, and he learned the sutras quickly. However, during a journey, he entered a village devastated by a cholera epidemic. Upon seeing many dead bodies, Kyong Ho had an insight into impermanence. Suddenly he realized that he had been studying the Buddhist sutras which deal with life and death, impermanence, and questions like, ‘What are human beings?’ and ‘What is the truth?’ He had been studying these sutras for many years, and still he was afraid of dying. So he returned to his sutra temple, Dong Hak Sa, and said to the monks, “I cannot teach you any more. Go away! ” He put down his books and began a period of intensive meditation. This is the story of Kyong Ho’s awakening. He closed himself in his room. His attendant would pass food through the door every day. Kyong Ho Sunim was sitting there with this big question: ‘What is life and what is death? Don’t know!’ In order to stay awake and alert when he was starting to falling asleep, he would hit his thigh with an awl to wake up. He did this for many months. Still not comprehending, the monk went back to Kyong Ho, knocked on the door and told the story. When Kyong Ho heard the line “reborn as a cow with no nostrils” his mind suddenly opened and he ended his retreat. From then on, he taught with complete freedom and became a famous Zen Master all over Korea. He was very unorthodox. Instead of shaving his head and wearing correct monks clothes, he was a kind of ragged, hippy monk. He went all around Korea, wandering from temple to temple, like a cloud or water just flowing with no hindrance. Years later Kyong Ho gave that boy Dharma Transmission and he became Zen Master Man Gong. When the Japanese occupied Korea in 1910, they viewed the Korean Buddhist sangha as a potential source of resistance. The colonial government tried to destroy the cohesion of the ancient Korean monastic community by forcing monks and nuns to adopt Japanese forms, including renouncing celibacy and eating meat and drinking alcohol. Under the Japanese, only married monks were to be permitted to serve as temple abbots. One senior monk refused the Japanese demand: Zen Master Man Gong of Su Dok Sa temple. His prestige and reputation were such that he was essentially untouchable. The governor-general could have executed Man Gong Sunim on the spot, but he could not answer this challenge. So Man Gong Sunim shouted, “KATZ!”, pointed to the governor general’s mouth, and said: “Then your mouth is the gate to hell.” Then he went back to Dok Seung mountain. There are many more famous stories about Zen Master Man Gong and his exchanges with monks, students, and other Zen Masters. Many of these have become kong-ans, unique to the Korean tradition, and you will encounter these if you practice with the Kwan Um School. Zen Master Ko Bong (1890 – 1962) was one of Zen Master Man Gong’s dharma heirs. He was the most unorthodox, and there are many stories of his “bad” behavior. He attained enlightenment while sitting the summer Kyol Che at Tong Do Sa temple. It was hot and he was sitting outside on a rock under a big tree, using a fan to stay cool while meditating. Keeping Don’t Know mind 100%, he heard the cicadas singing in the tree above him. His mind opened. Filled with joy, he spontaneously hit the rock beside him with his fan and it broke. “That’s it!” he cried, and burst out laughing. 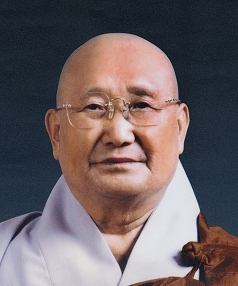 Ko Bong Sunim was renowned for being one of the fiercest keen-eyed masters of his generation, well known for his deep enlightenment and wide actions. He mostly refused to teach Korean monks, calling them arrogant, and preferred only to teach nuns and laypeople. Until he met Seung Sahn Sunim, Zen Master Ko Bong had never given inka or Dharma transmission to any monk.